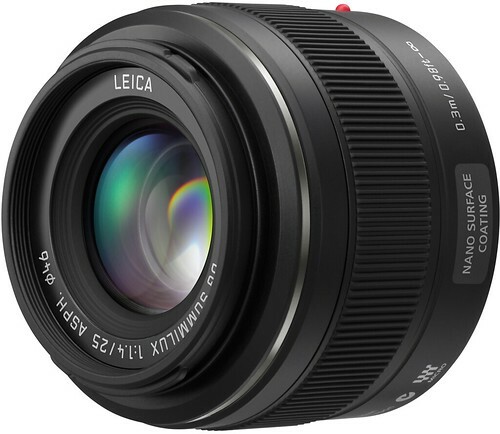 Note that the Summilux 25/1.4 ASPH lens is designed to be used with the Lumix G Micro System range of interchangeable lens, mirrorless Micro Four Thirds (m4/3) digital cameras. Being a m4/3 lens, the equivalent zoom range in 35mm terms is 50mm. A couple of full-sized, full-resolution Panasonic GF3 sample images shot with the Leica DG Summilux 25mm F1.4 and other lenses can be viewed in this official Lumix GF3 gallery. The filter thread size on the 25/1.4 is 46mm, which means you’ll want to be looking at purchasing 46mm filters. Official Panasonic 25mm f/1.4 page at Panasonic Global.